Here at Dark Knight Armoury, we strive to meet all of your armor needs, providing a wide selection of metal armor in a range of styles. 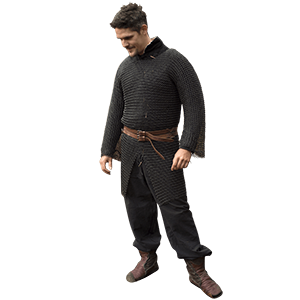 Craft your perfect medieval or fantasy ensemble with our steel armor, leather armor, and chain mail armor in grades that are perfect for costuming, LARPing, or SCA events. 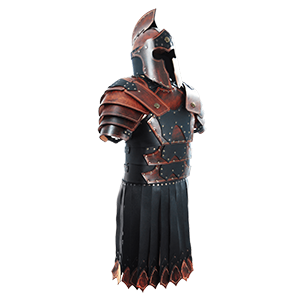 We offer armor sets or individual pieces, including leg armor, arm armor, and body armor. Finish off your period warrior look with one of our functional helmets. 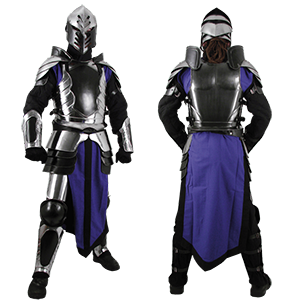 Of course, no re-enactment armor set is complete without the appropriate arming clothes and armour padding to increase comfort and safety while you fight. 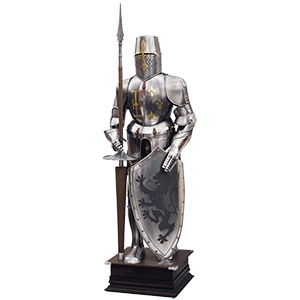 So, whether you are seeking out a suit of armor decor set or a complete armor package for your next Ren fair or fighting demonstration, we are sure to have just what you have been looking for! Armor is not designed specifically to be comfortable. In armor, protection trumps comfort every time, which is why at Dark Knight Armoury, we sell a diverse array of effective and attractive pieces of arming clothes. Arming clothes is traditionally serves two purposes. It adds a layer of padding between armor and the person underneath and it also provides a secondary layer of limited protection. As additional padding, gambesons and arming caps serve to prevent armor from pinching, chaffing and otherwise causing extreme discomfort in the wearer. They also add additional bulk, which ensures the armor fits snugly and securely. Arming clothes like gambesons, arming caps, and arm and leg padding can also act as limited protection. Thickly padded arming wear can act as a sort of dampener, cushioning the impact of glancing blows. 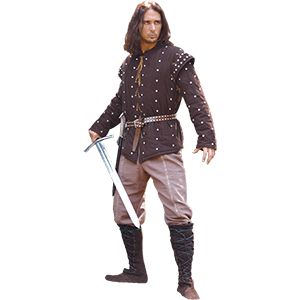 Our arming clothes comes in a variety of styles and has a variety of uses, and any of our gambesons or other arming wear can be worn with metal or leather armor without issue. 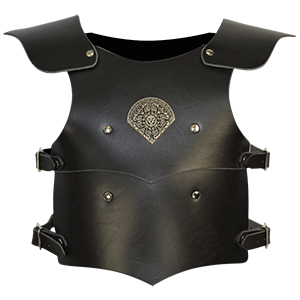 And with styles fit for crusaders, knights, woodsmen, vigilantes, and everything in between, you will be hard pressed to find a selection of arming wear as impressive as Dark Knight Armourys. Helmets are a distinctive part of any warrior attire, whether he or she is from the medieval era, a world of fantasy, or anywhere in between. At Dark Knight Armoury, we offer an absolutely huge selection of helmets, all offered from some of the top suppliers possible, to ensure that you get a helmet to protect your noggin, you do so with quality armor and with great style. Like so many other pieces of equipment from the Middle Ages, helmets are incredibly varied. They come in dozens of different styles, many of which are attributed to many different cultures. Some are more effective than others, while others are far more appealing because of their appearance. But the one thing you can rest assured of is that when you get your helm here, you are definitely getting a quality helmet that look great, whether you wear it or display it on a helmet stand as a display in your home or office. 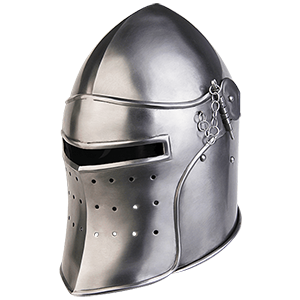 And like the rest of our medieval wares, we endeavor to offer as wide an assortment of helmets, from as many sources, cultures, and time periods as is possible. Of course, Greek helmets and Roman helmets are well-known and so we carry lots of those, ensuring that reenactors and collectors who are interested in early history can have the helmet of their dreams. We also offer Viking, Norman, and Saxon helmets, for those who are interested in the helms worn by those during the early era of the medieval times. Medieval helmets offers some of our most numerous options, ranging from sallet helms to great helmets to pot helmets and more, while our selection of fantasy helmets includes impressive examples from the world of fantasy and fiction, so much so that they are sure to be impressive no matter what. The leather helmets we offer range from medieval to fantasy and beyond, and are great for a variety of situation and uses, too. We also offer helmet stands for displaying your helmets, as well as miniature helmets for the collector who prefers to keep things small and space-efficient. And that is only a small sampling of what we offer, so if your interest has been piqued, then take a moment to browse through the helmets section at Dark Knight Armoury, to see what is out there and what else might capture your interest. At Dark Knight Armoury, we offer DIY Armor Pieces for craftier LARPers and historic reenactment enthusiasts looking to build their own custom armor or repair existing armor. 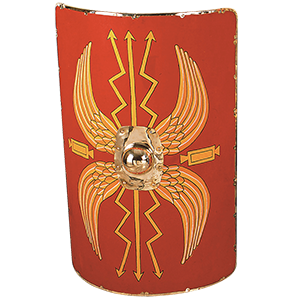 Scale armor, ring armor, and plate armor are all made up of segments, and we carry the essential pieces that make up these armor styles, such as our lamellae plates. These plates are used to make up lamellar armor, which was typically worn by historic Vikings, Samurai, and Roman warriors. 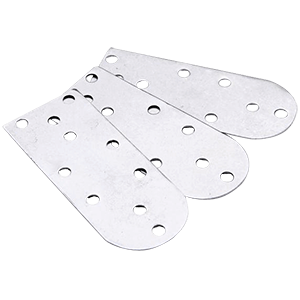 We offer these plates in a variety of materials, such as steel, brass, and aluminum, great for creating a unique look that is all your own. With our build-your-own armor parts, you can now craft or modify armor to perfectly suit your own, specific needs and tastes, limited only by your ability and imagination.